All kinds of curious researchers find their way to the library and discover the White Plains Collection can help answer their questions. I've helped people find their yearbook picture, learn about the people who used to live in their house (no American Horror Stories uncovered yet), unearth lost city reports, and find photographs they didn't know existed. Two recent research queries covered similar topics, and all the researchers are generating interesting projects about Greenburgh. 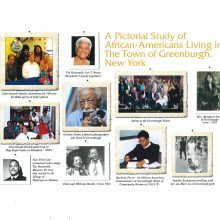 The Greenburgh African American Historical Alliance is a newly formed community-based organization created to assist in the historical preservation of African American heritage, history and culture in the Town of Greenburgh, NY. The founding members contacted the library with help during the early stages of their research. They found maps, photographs, and official documents related to the Fairview area of Greenburgh and are creating a pictorial history. They want to include pictures taken in Greenburgh (especially of family reunions and vintage pictures of people, places and events), videos, art work, letters, news clippings, supporting documents, and stories from as many people as possible. Check out their Facebook page and get in touch with them if you can help! 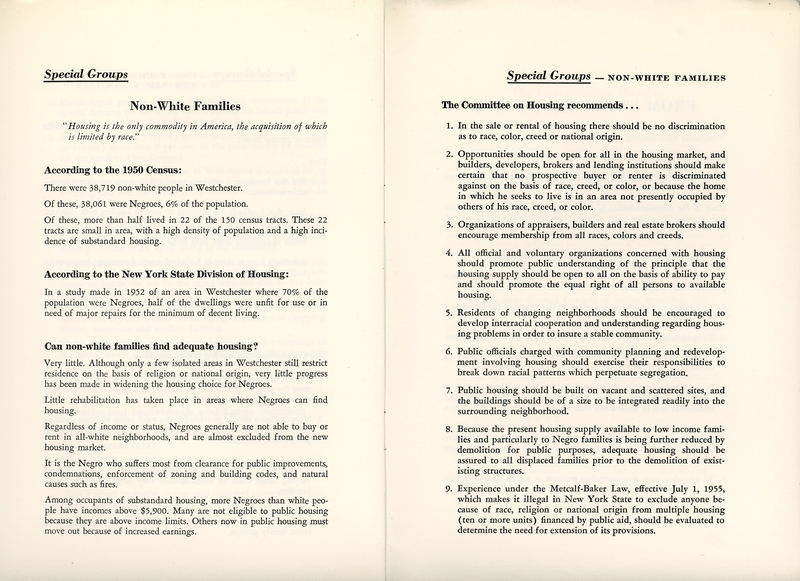 A guide to African American housing choices published by the Urban League in 1963. Dan Weinfeld is a Greenburgh resident and lawyer who has written books on Florida during the Reconstruction Era. He blogs on his history interests and recently published two fascinating local history blog posts. The first post chronicles his realization of the large extent to which the Fairview area was reshaped by urban renewal and will be of interest to anyone who wants to understand how Greenburgh developed. The second post details his method of using the census and supporting materials to map the course and extent of Fairview's development by African Americans during the 19th and 20th centuries. Weinfeld's research and posts are great examples of how local history can be used to inform community discussion and local planning decisions. 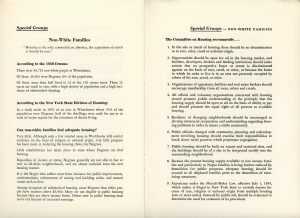 Part of a report by the Westchester County Council of Social Agencies published in 1957 that examined housing affordability and practices. 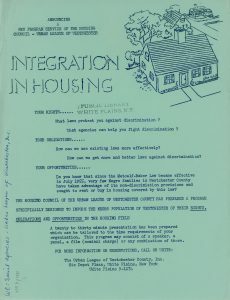 A flyer from 1961 for services provided by the Urban League to people experiencing discrimination in housing. 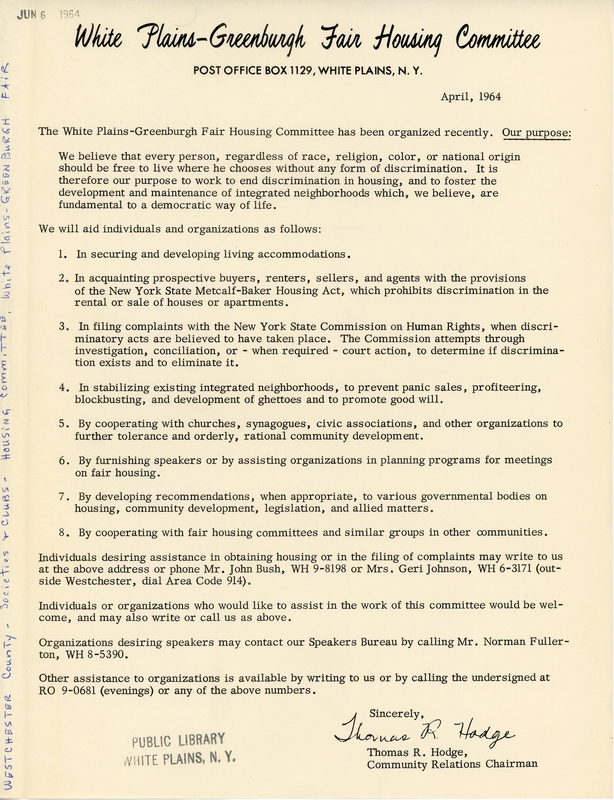 Weinfeld's query led me to search the White Plains Collection for any documents or items having to do with Fairview and the development of African American neighborhoods in Westchester. 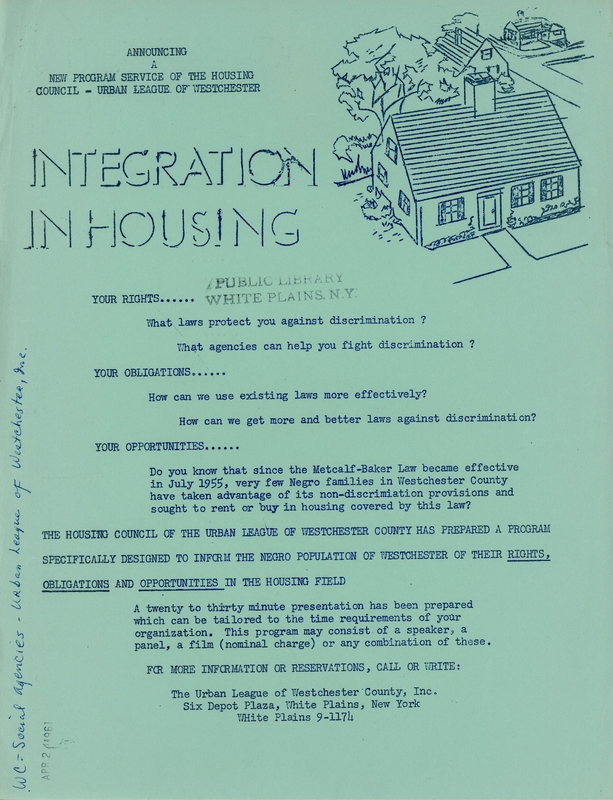 The library's collection contains evocative flyers and informative public materials for organizations like the Urban League, the Westchester County Council of Social Agencies, and the White Plains-Greenburgh Fair Housing Committee. 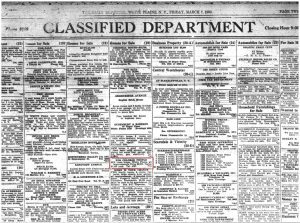 I also came across a classified listing in the March 7, 1930 Daily Reporter that offered a house “For Colored People.” Although this kind of overt discrimination in housing became illegal by the mid-1960s, historical patterns and structural inequality perpetuate the segregation of American communities. For a visual representation of ethnic and racial segregation in America, check out this map from the New York Times. Other sites like Vox, FiveThirtyEight, and the US Census Bureau also have fun, informative, and pretty maps. Remember–it's just a map, just a visualization of data. A map that is dramatically divided between red and blue may accurately show who won a given election, but it makes diversity and nuance invisible (the purple). Be careful how much you read into maps, especially ones that seem to offer easy conclusions. In a post-truth era when the power of opinions and feelings to sway people is in close competition with the power of facts and data, it benefits our society as a whole to question our assumptions and doggedly pursue reliable information. 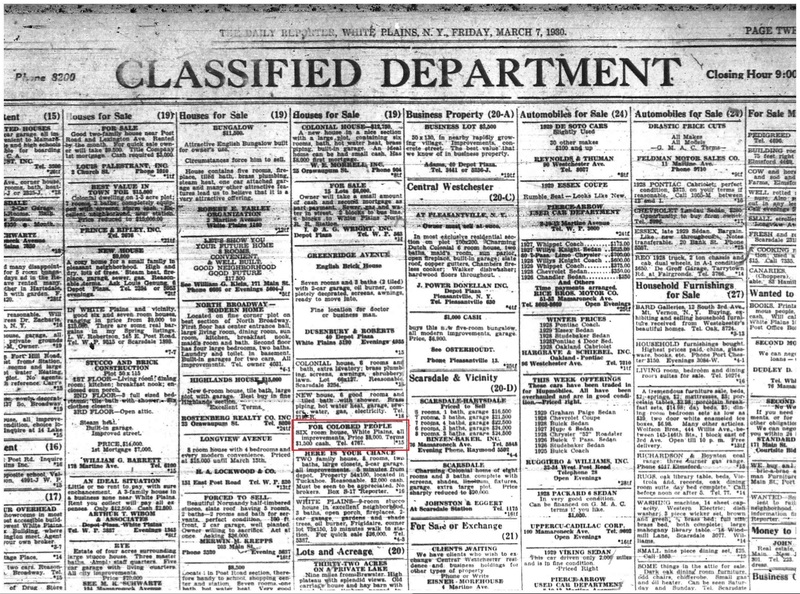 A classified ad for a house “For Colored People” from the March 7, 1930 Daily Reporter, a newspaper published in White Plains. 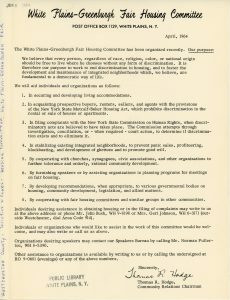 A press release announcing the formation of the White Plains-Greenburgh Fair Housing Committee from 1964.